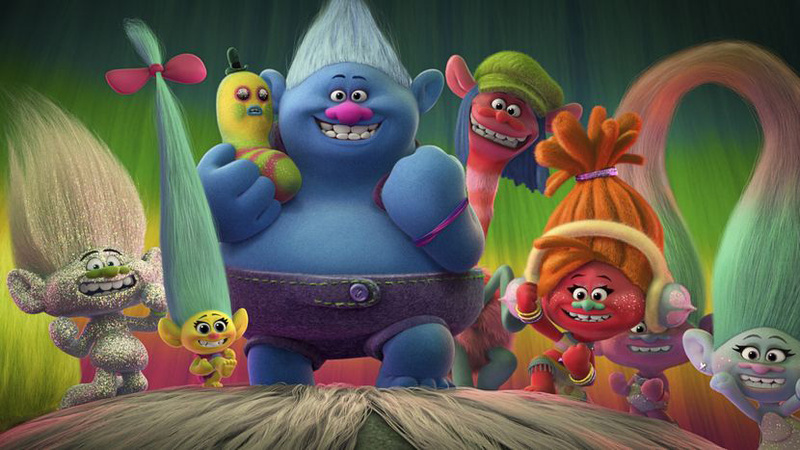 TROLLS is an adorable, heart-warming, smart new animated children’s film from the folk at Dreamworks. It creates a world in which the happy, huggable, fun-loving trolls are on the run from the mean sad Bergens who think the only way they can be happy is to eat a troll. The trolls are supposedly safely in hiding until a super loud fun party arranged by Princess Poppy (Anna Kendrick) gives away their hiding place to the evil Chef Bergen (Christine Baranski) who wants to cook them for her King (Christopher Mintz-Plasse). This prompts Poppy to go on an adventure to rescue her captured friends with the help of the one unhappy, sarcastic Troll called Branch (Justin Timberlake). But once she finds her friends, Poppy's mission changes. She wants to help a lowly Bergen scullery maid (Zooey Deschanel) find true love with the Bergen King and show all the Bergens that happiness comes from within, rather than from eating a cute little Troll. The film is funny and sweet and filled with great songs. Although the movie appropriates 80s pop classics, it does so in a really intelligent way. So when JT breaks out into a cover of Cyndi Lauper's True Colours it actually moves the narrative and emotional arc of the movie forward: when we get to the lyric "and that's why I love you" it actually means something. The animation is also first class. I loved the fuzzy dingy carpet texture of the shabby-looking Bergentown palace and the clever pipe-cleaner style animation of the animals in the Troll forest. The direction is first class too - the movie finds just the right balance of threat and wonder in the action sequences and the pop culture references and dance sequences are never over-done or too frenetic. Overall, TROLLS is just a great time for kids and adults alike and should utterly redeem the image of the annoying plastic toys in the eyes of the general population. TROLLS has a running time of 90 minutes and is rated PG. The movie opens on October 14th in Denmark and the Netherlands; on October 21st in France, Germany, Estonia, the UK, Ireland and Lithuania; on October 27th in Belgium, the Philippines, Hungary, Italy, Portugal, Russia, the Ukraine, Bulgaria, Finland and Sweden; on November 3rd in Argentina, Brazil, Colombia, Hong Kong, Croatia, Cambodia, Macedonia, Mexico, Malaysia, Slovakia, Thailand, India, Poland, Romania and the USA; on November 10th in Singapore; on December 2nd in Austria; and on December 10th in Australia.